Army sharpshooter Vijay Kumar came through a nerve-wracking battle with five other leading marksmen to clinch the silver medal in the men's 25m Rapid Fire Pistol event at the London Olympics on Friday. He beat back a strong challenge from World champion Alexei Klimov of Russia, the Chinese duo of Ding Feng and Zhang Jian, and Germany's Christian Reitz in the 40-shot final to finish runner-up in a thrilling finale, behind Cuba's Leuris Pupo, who shot his way to the gold with a World record-equalling score of 34. The 26-year-old army subedar from Himachal Pradesh found the target 30 times in 40 attempts in the series, comprising eight rounds of five shots each. The silver is India's second medal in the ongoing quadrennial extravaganza after fellow-marksman Gagan Narang's bronze in the 10m Air Rifle event on July 30. This is also the country's fourth medal in Olympics shooting history. The other medal winners are Rajyavardhan Singh Rathore (silver, 2004 Athens), Abhinav Bindra (gold, 2008 Beijing) and Narang. 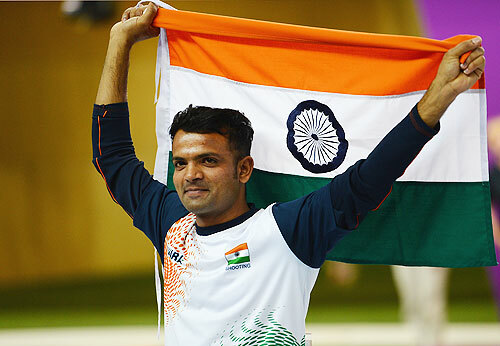 Kumar started with a bang, hitting the target on all five attempts and kept himself in the hunt for a medal. After a perfect five out of five at the start, the 2010 Commonwealth Games' double gold medallist was on target four times in the second and third series, but missed it twice in the fourth. 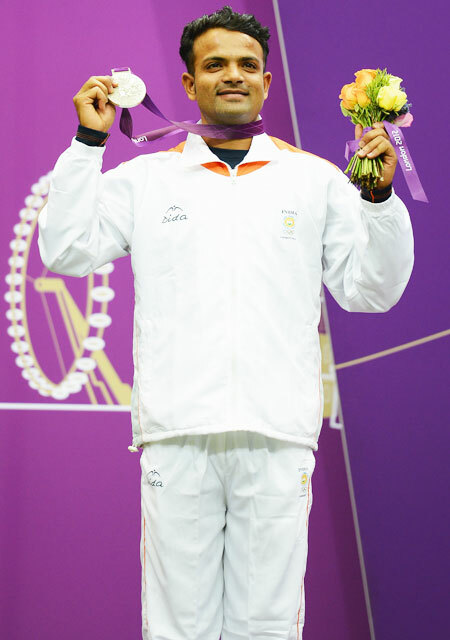 He came back strongly by finding the target four times in the next three rounds and clinched the silver. In the last round, after Pupo shot four to clinch gold, Kumar seemed to relax a bit and missed the target thrice. The bronze medal was won by Feng with a tally of 27. In the final, Kumar was assured of a medal following the elimination of the trio of Klimov (23), Jian (17) and Christian (13) leaving himself, Pupo and Feng in the fray. 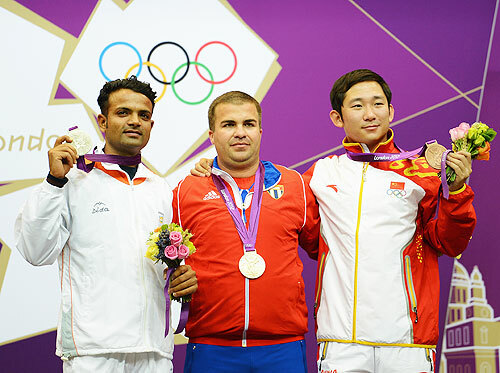 The silver was in his bag when Feng missed twice in the seventh round and Kumar replied with four. 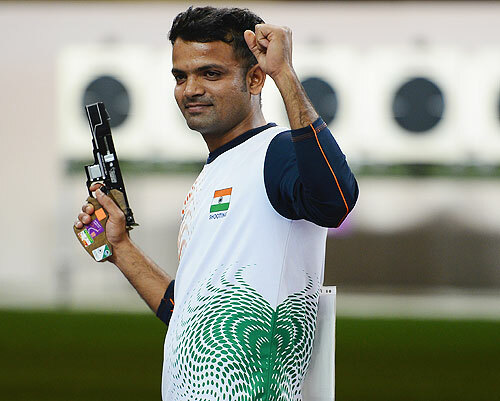 Kumar had earlier lifted the Indian shooting team's spirits after the flop show by Narang, who failed to qualify for the final of the 50m Rifle Prone, by entering the final of his event through the preliminaries. 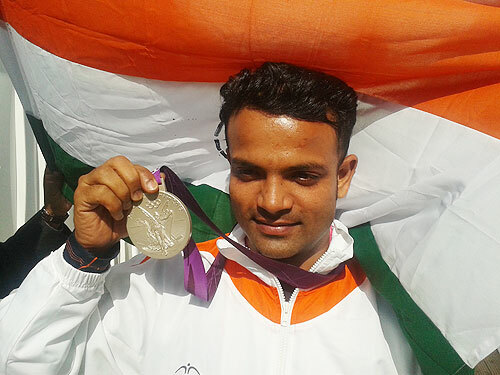 En route to his total score of 585, Kumar became the second shooter to break the previous Olympic record of 583, giving a hint of his potential during the second stage of qualification. Placed fourth in the list, Kumar, who had scored 293 in stage 1 of the qualification on Thursday, shot a series of 98, 97, 97 in the second stage to take his total score to 585. He then had a sequence of 99 96 98 to earn a place with the five best shooters for a medal. Kumar said he tried to control his emotions going into the final. "I was just trying to control myself and accordingly performed," he said after the event. Crediting his coach Pavel Smirnov for his success, he said he was not full fit in the run-up to the Games as he was down with a shoulder injury, but "took a bit of rest to heal the shoulder". "He [Smirnov] has been a great support for the past 3-4 years," he added.